Om Prakash, Curzon House 1966 Batch, passed away at Chandigarh this morning (28th April 2018). Cremation is on 30th April 11 AM at Sector 25 cremation grounds Chandigarh. Our condolences to Ompi’s family. This entry was posted in Obituary, Post and tagged 1966 Batch, Chandigarh, Curzon House, Obituary, Om Prakash on April 28, 2018 by admin. I have a mail from K S Dugal, who is currently in the US, that Mr B R Roberts passed away yesterday, Thursday, April, 12, 2018. I have just received another message with the obituary notice which is sent as an attachment to this mail. There are many memories of this warm and affectionate teacher. He was House Master, Lefroy and he meant a lot to so many of us. I will write more and in detail as more and more memories pour in. Right now the shock of his passing away is hard to bear. Leaves you empty. I am trying to find more details since I am sure some of you would like to contact his family. 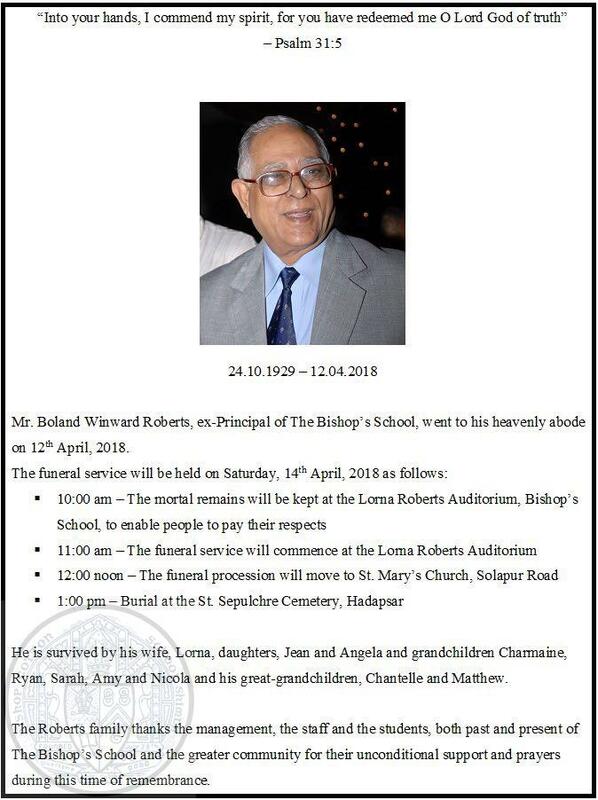 Mr. Roberts passed away on 12th April. Haven’t got any more details yet. He had been n Pune since early ’80s as principal of Bishops School here. He retired several years ago. This entry was posted in News, Obituary, Post and tagged B.R. Roberts, BCS Teacher, Lefroy, Obituary on April 13, 2018 by admin. 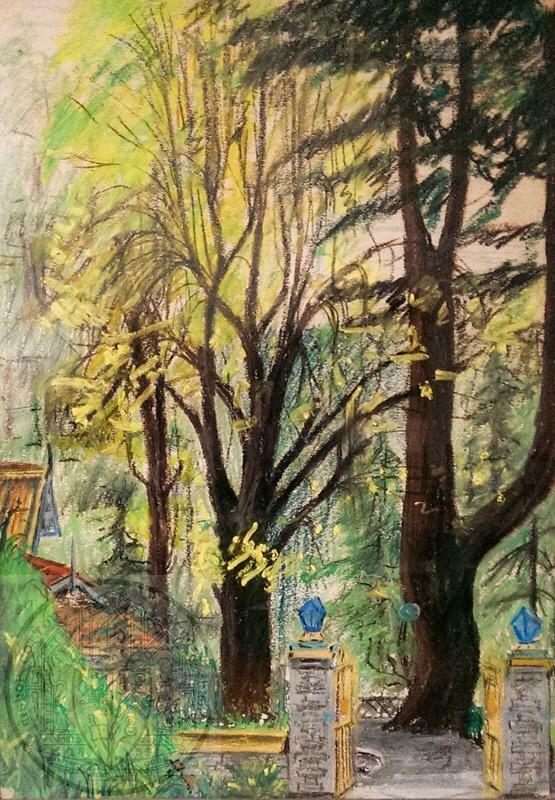 Sad news… Ajay Badyal – Rivaz House 1966 batch. Passed away in New York after a fight with cancer. He was working with the US Federal Reserve. This entry was posted in Obituary, Post and tagged 1966 Batch, Ajay Badyal, Obituary on April 4, 2018 by admin. The Passing of a Brother Cottonian. Lefroy Class of 1968 passed on, on 13 January 2018. MOUNTAIN was a gentle soul and lived a quiet sedate life in Nasik.. In School he was that dashing handsome dude, Actor, Prefect, Sportsman and a through Gentleman. He was closely related to my Brother Sharat ( Lefroy ) and me both as Family, Friend and the guy who whacked me with his favourite leather slipper..after breakfast. He spent many years in New York working with the Bhumitra Brothers ( Lefroy) in the Chatwal range of restaurants;also in Bangkok with the Narulas( Rivaz). He had some very close friends; friends that he made in BCS, for life. He will be remembered, always. This entry was posted in News, Obituary, Post and tagged Narendra Nath Khanna, Obituary on January 13, 2018 by admin. Thank you for your message which has come as a shock and a surprise. Emotions overwhelm you on such occasions. places, people and events that happened so long ago. happened ? Did this passage of time move so quickly ?” Disbelief. photograph bears such a close resemblance of your father, Mr P M Varughese. and gratitude for the fact that they touched our lives. away on 20th November in Delhi at my other sister Sara’s home. Dist, Tamil Nadu on 24 Nov. I am attaching the PDF of the obituary in the Hindu (all editions). This entry was posted in News, Obituary, Post and tagged Mary Varughese, Mrs. M. Varughese, News, Obituary on December 29, 2017 by admin.